What if you could trade details on the whereabouts of wandering tattlers with hundreds of other amateur (and professional) ornithologists across North America? This exchange of information is now quite easy, as the very helpful eBird website developed by the Cornell Lab of Ornithology and the National Audubon Society can facilitate all of this and much more. With this site, visitors can enter their own bird observations, or access the entire historical database to find out what other users of the eBird site have to say about their own bird watching forays. 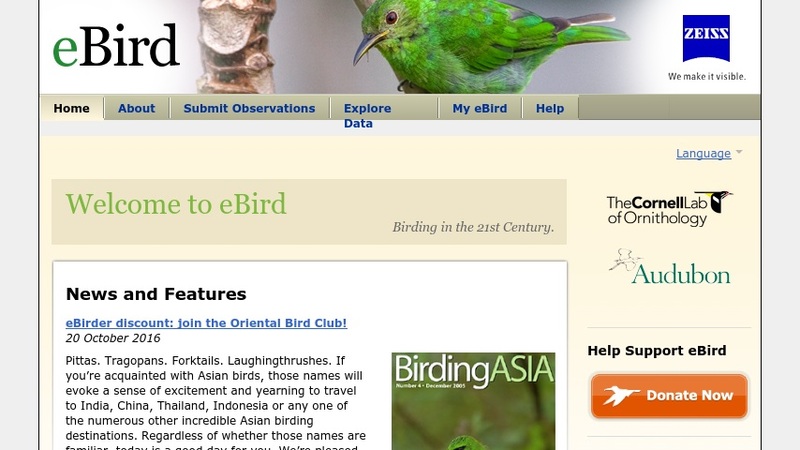 Of course, before getting started, visitors may want to read the ï¿½About eBirdï¿½ section, which includes a number of tutorials on how to use the system. The site is rounded out by a nice glossary, which includes information on such terms as ï¿½Birds Per Hourï¿½ and ï¿½Casual Observationï¿½.